As parents you are at the centre of the team caring for your baby. There will be a number of staff with different areas of expertise involved in your baby’s care. There is a bedside nurse in the room with your baby 24 hours a day. There is also at least one resident doctor (doctors starting their specialist training in paediatrics) and a Fellow (a doctor finishing their specialist training in newborn paediatrics) in the unit 24/7. They will be able to answer many of your questions and plan with you many aspects your baby’s care. Care managers are senior nurses who help coordinate your baby’s care and support you and your family. There is a care manager available seven days a week during the day. They will contact you as soon as possible after your baby is admitted. 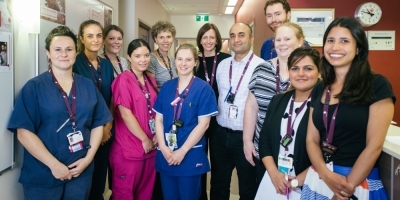 Associate unit managers (AUMs) are senior nurses who lead the team each shift, 24 hours a day. Consultants are specialist paediatricians who are the senior doctors. They have overall responsibility for the medical care of your baby. There is a consultant for eachteam during the day who will be able to discuss your baby with you. After hours, there is a consultant available as needed. You may also meet our social workers, developmental team, lactation consultants, pharmacists, psychologists, pastoral care workers and non-clinical support staff. Staff in NICU wear identification cards. If you don’t know who someone is, or what their role is in caring for your baby, please ask them. If a baby dies, holistic care for women and bereaved families is provided at the Women’s by the Reproductive Loss Service. The team members include doctors and paediatricians, nurses and midwives, genetic counsellors, social workers and pastoral workers.